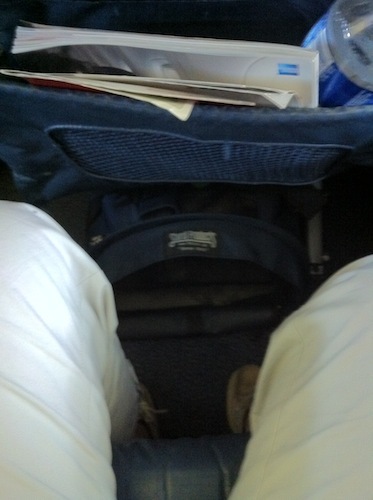 Ahmé sent a couple of pictures of Thomas’s carrier in place under the aisle seat — one view from the aisle, and one from above, past her knees. 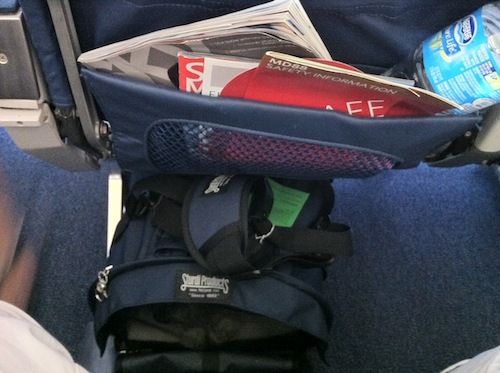 While the carrier looks a little long in the first shot, you can see in the second that it really doesn’t extend more than an inch or so past the plane of the magazine holder on the back of the seat, so it works. Remember to disregard the “awning” over the entrance of the SturdiBag when you’re looking at its length — it’s just a flexible piece of fabric. Thank you so much, Ahmé, for the wonderful photos and the report about your trip! 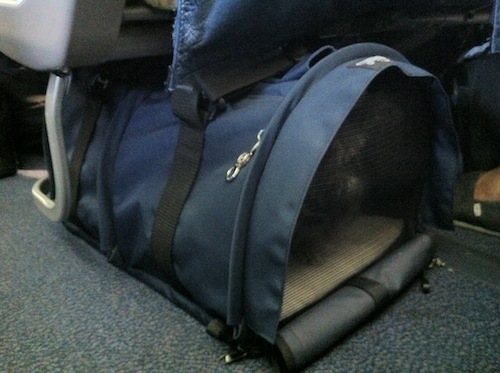 I’m adding your info and pictures to Dog Jaunt’s ongoing series of posts recording airplane under-seat measurements, and to Dog Jaunt’s ever-growing collection of pictures of carriers deployed under plane seats. 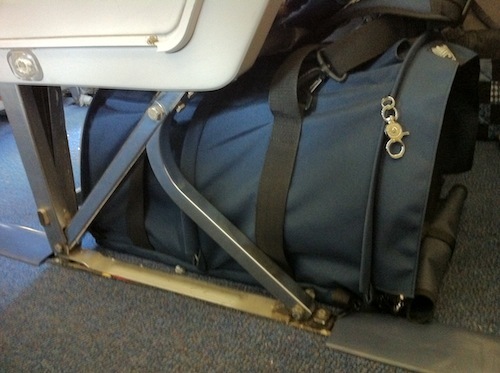 What were the actual dimensions of the seat?did the crew say anything to you about the carrier sticking out? Hey, Lauren! I don’t believe Ahmé had a measuring tape with her (it’s only odd birds like me who do), but that’s a large-sized SturdiBag she was using, and that gives you a pretty good idea of the available space. Apparently she did not have any problems with the crew being concerned about the carrier. 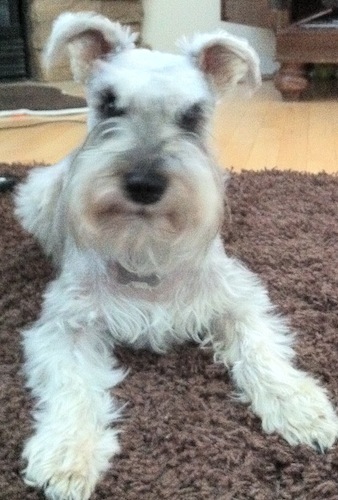 How big is your mini schnauzer (height specifically)? I have a schnoodle who weighs 16 lbs and in a couple days we are making a trip with him in cabin, I’m a little nervous about him being comfortable and the airline agents allowing us through, but his last (and only!) experience flying in cargo was absolutely traumatic for him. Btw, I am traveling with him in a large Sturdibag also. 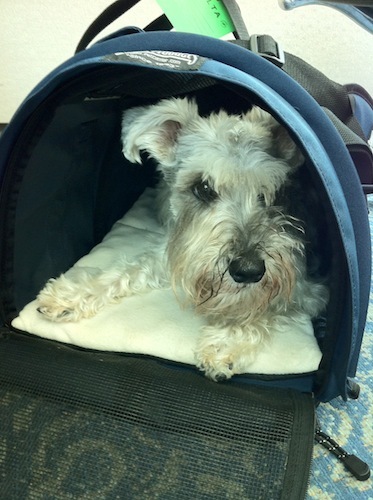 How was your dog after the flight? How long were your flights too?